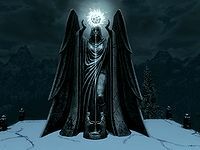 The Statue to Meridia is the shrine to the Daedric Prince Meridia. The climb to the shrine is a relatively easy trip comparatively. Steps are cut into the mountain, and the shrine is quite visible. The structure is built in the fashion of a stone, stepped pyramid. The door to the corrupted remains of her temple is built into the base of the shrine on the east side, but will only become visible when the related quest is initiated. The stairs to the apex are on the south side of the structure, where the statue of Meridia faces off into the north. A view of Kilkreath Ruins is seen off to the east. A very short distance up the mountain to the northeast is a Word Wall with the Elemental Fury shout. Visiting this location, if you have not already started it, will start The Break of Dawn, Meridia's Daedric Quest. This page was last modified on 24 April 2014, at 18:03.